Description: THOMASTON/CONN., Litchfield County, SEP 14 (1867) Charter Oak Fancy Cancel on Scott #65, 14 On-Cover Examples Documented. Description: CSA usage of US postage 3 cent 1850's red postal entire with manuscript "Sugartown, La., February 23th, 1861" postmark sent to New Orleans, La. Description: CSA stampless cover with manuscript postmark "Horse Pasture, Va., Jun 26th, 1861" with matching "Paid 5" rate sent to Lynchburg, Va. Description: CSA stampless cover with "Berry's Ferry, Va., 3 Dec 1861" manuscript postmark with matching "Paid 5" rate to Martinsburg, Va. (West Virginia). Description: 3 cent pink postal entire postmarked CAMBRIDGE, MASS., JAN. 5 with fancy skull Skinner - Eno No. PH-M-32 sent to Springfield, Mass. Description: 1870 3c green Reay issue postal entire (#U82) with "Baltimore Md. 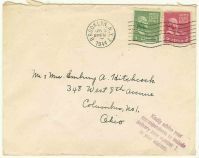 Jun 16, 7 PM" circular date stamp and cork cancel, to New Oxford, PA. Description: Auxiliary mark to encourage WWII Zone addressing: "Kindly advise your correspondents to include delivery zone number 1 in your address."